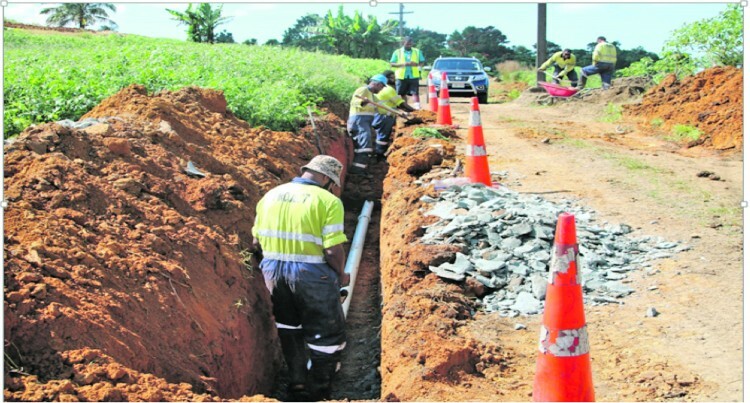 Over two hundred villagers of Wainibuku Top Settlement at 9 Miles, Nasinu, will soon have access to piped water after the completion of main water ex­tension works by the Water Au­thority of Fiji (WAF). The $632,750.00 water project in­volves the extension of water pipes to the settlement. This comes with the installation of 1.2 kilometres of PVC pipes, a booster pump and an elevated tank structure to cater for a 25000 litre tank. Work began on April 23, this year and is expected to be completed by the end of this year. Wainibuku Top Settlement resi­dent, Ajit Singh, 46, said he was grateful to WAF for undertaking the main extension project. Mr Singh said: “We have been fac­ing water problems for so many years. As a farmer it has been re­ally difficult for me”. Another Wainibuku Settlement resident, 54-year-old, Seremaia Bati, said: “We have been facing a lot of hardships in terms of water. This well dries up during dry sea­sons, and people then had to walk two kilometres to the road to col­lect water. “I am thankful to Government for allowing this project to take place and making this project a reality. “We have school children and many others that will benefit from this project. We are really grateful” said Seremaia Bati. “We are overjoyed as we can see the water pipes are being laid along the road. This is a big relief to us, it will make life easier for us, especially for the school children, for us making our meals and other chores, we are really thankful to the Water Authority of Fiji, thank you,” said Mr Bati. Once the project is completed, cus­tomers will get 24/7 water supply at the turn of their tap with adequate pressure. It will also have the abil­ity to accommodate new develop­ment, as Wainibuku is a growing settlement. WAF chief operating officer, Mr Samanmal Ekanayake, said the settlement would soon enjoy a con­sistent supply of water that should withstand dry seasons and an im­proved water system performance. Mr Ekanayake said WAF would continue to implement works that ensure Fijians have access to safe drinking water and proper sanita­tion.